It appears I am at a turning point, and as scary as they can be, turning points can actually be very good things. It seems I have exhausted all of my normal “state” unemployment benefits. This past week was my final week and the “federal” extension is about to kick in. It won’t matter too much longer anyway though because I am finally closing deals and getting ready to start making a normal income again, working for myself. It will be nice to know that I have the money in the bank to pay the essential bills and start catching up on the others. Who knows, I might even have enough soon to take the kids to the bookstore again (our family’s favorite thing to do). The birds were out in force today. 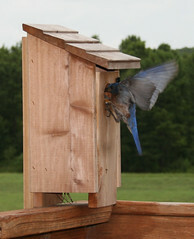 I missed a photo of 12 baby cardinals on the deck, but I did get a few good ones of the bluebirds and the hummingbird. With things getting ready to ramp up I think a weekend photo-walk is in order. Maybe we will hit one of the state parks, if the weather cooperates with us. Tomorrow is hump day, and I have several calls to make. I have two small conference calls scheduled, and I hope to finish up a couple maintenance issues with the server. So, yes, tomorrow will be a busy day, but it’s all downhill after that until Friday, right?